Back in the 1980s and 1990s an electronics engineer called Richard Hay designed a number of amplifiers under the Nytech and Ion Systems brand names that gained an almost cult following. Unfortunately, despite Hay's enthusiasm, both Nytech and Ion failed, and with them, the popular Obelisk amp design disappeared from the market. Gone, but not forgotten: the Ion Obelisk still has its followers, especially within the Hungarian hi-fi fraternity at Heed Audio, makers of various electronics components including pre/mono amplifiers, headphone and phono amps and even turntable power supplies. 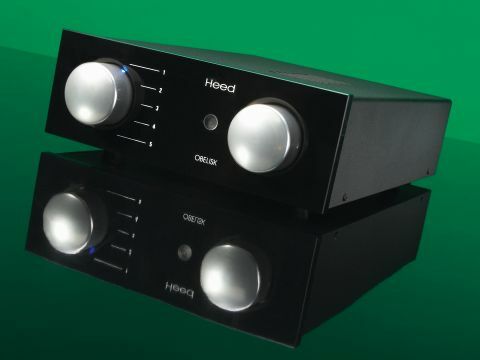 Heed's Zsolt Huszti decided to rebuild the Obelisk, basing its power amplifier on Richard Hay's design, albeit with heavy revision and the addition of his own preamp section. The Obelisk Si (Super integrated) is the first example of what Heed intends to be a small range of amplifiers that will include an entry-level model and a power supply (X-2) that forms a dual-mono supply for the power amp section of the amp. To this end, the Obelisk Si comes with a blank connector to bridge the power supply input, the presumption being that the external supply will be added at a later date. This is similar to the upgrade routes offered by Naim and Cyrus. The Obelisk features one pre-output and five line inputs, one of which can have an internal card added to turn it into either a phono stage, or a digital to analogue converter (DAC). At the time of writing, neither were available. Power is specified as 40 watts a side. Heed is at pains to point out that the Obelisk is not DC coupled, something which Zsolt has very little time for, although this hardly picks him out from the crowd. He also describes the power amp as a "valve amp built with transistors", the inference being that it clips in the smooth style of a valve amp. The Obelisk does indeed display some valve-like traits, most notably a good grasp of dynamics that injects music with a liveliness and energy that is easy to enjoy. It doesn't, however, have a smoothed-off top end, but instead, seems to stretch further than one might expect of a compact 40 watt design. Our reference speaker for an amp of this price is the ATC SCM19, which gives low sensitivity but offers a benign load, so much so that the 40 watt Edgar valve amp could deliver reasonable levels through it. The same applies here, but the sound is distinctly different. The top end is more open and extended and there is clearly more attack to notes. Strangely, this extra edge does not seem to help the Obelisk when it comes to timing: in fact, it lags behind the Edgar in this respect. Further investigation by us pinpointed the bass as the slowing factor. This could have something to do with the Obelisk having more bass extension as a result of its solid-state nature, although it's no heavyweight by any means. An alternative reference point in the form of Cambridge Audio's 840A showed the Obelisk a thing or two when it came to power. It delivered more body and weight, as well as extra headroom thanks to its 100 watts. However, the Obelisk does deliver a crispness and attack that is convincing. It makes metal instruments sound more real and allows good contrast between loud and soft notes. It suits acoustic material very nicely, if the speaker is evenly balanced. It is also very musical, which is what Heed claims to be aiming for and seems to have succeeded in delivering. Despite facing some strong competition at its price point, the Heed Obelisk warrants your attention. It really does make that solid-state valve-sound dream a little closer to reality.